Which and Whose Aircraft Carrier? 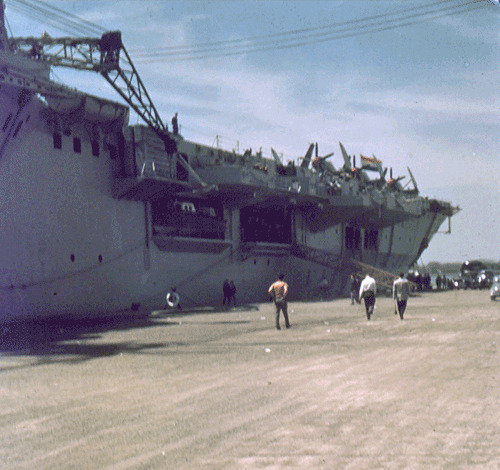 During the 50s or early 60s this aircraft carrier was photographed by Annie M.E. Shill in the port of Montreal. 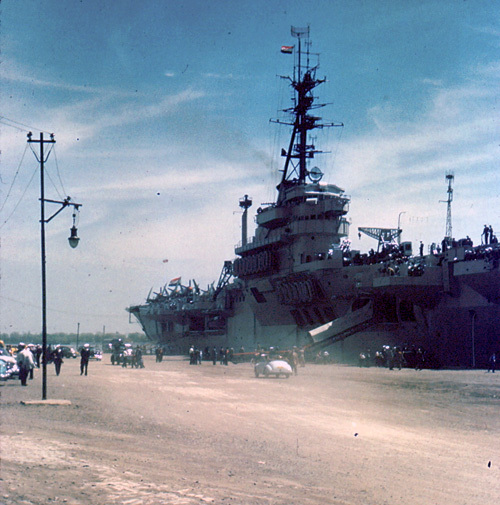 In the full-size scan of the slide it is evident that the aircraft on board are Hawker Sea Furies. The flag with 3 horizontal stripes, which appears to be orange, may actually be red, white and blue, as in the flag for the Netherlands. The Netherlands is one of the countries that purchased the Hawker Sea Furies according to wikipedia. A search of Google News Archive finds two articles which mention a Dutch aircraft carrier, the Karel Doorman, being in the port of Montreal. La Patrie of April 28, 1954 reports that the Karel Doorman would be in Montreal from May 12-17 on a courtesy visit 2 or 3 years after the visit of Canada's HMS Magnificent to Holland. The second article tells of a seriously injured Dutch Seaman who was brought to a Montreal hospital and the arrival in port of the Karel Doorman in September of 1961. The ship would be open to the public for visits on the Saturday, Sunday and Monday of its stay in port. 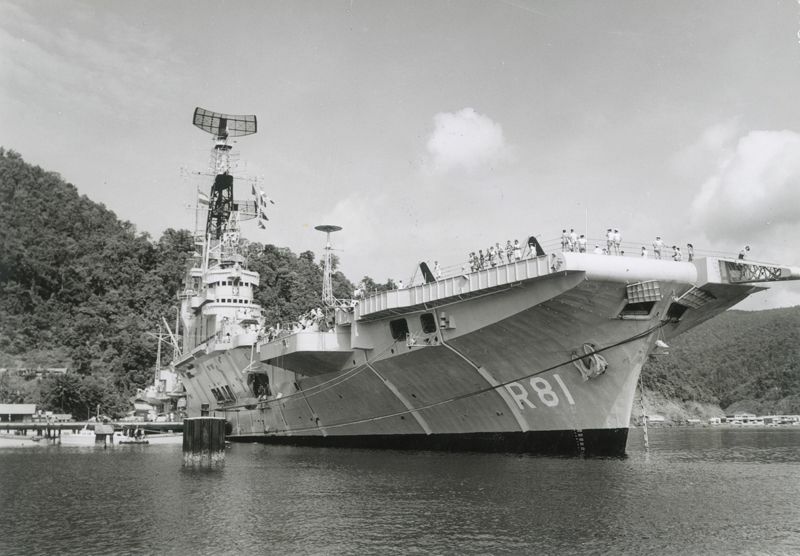 The Karel Doorman, previously named the HMS Venerable, was acquired by the Dutch Navy in April 1948 from the Royal Navy and was later sold to Argentina in 1969 or 1970. Thanks to the assistance of experts at the ﻿Historic Naval Ships Association﻿ and Patriots Point it has been confirmed to be the Dutch ship the Karel Doorman or Dorman. A higher quality image of the ship can be found here. And a 20 minute colour video here. Arriving or Sightseeing in the Port of Montreal? Do you have a story and/or photos about arriving by ship in the Port of Montreal? Have you visited the Port of Montreal to watch the ships?